“If the world hates you, keep in mind that it hated me first. If you belonged to the world, it would love you as its own. As it is, you do not belong to the world, but I have chosen you out of the world. That is why the world hates you. Growing up where Christianity was a cultural norm, Christ’s words about the world hating us because it hated him first were confusing. In today’s world, they make more sense. Hatred is big business today. Hatred is the number one way to be elected—the number one way to build an audience. It’s the number one way to advance in a world where every follower means not just money, but power. It should be no surprise to Christians that the world’s hate machine often turns our way. It’s not like Jesus didn’t warn us. There are two groups of people who seem to have a kind of blindness about the persecution of Christians. Both groups are blinded by privilege. Some are blinded by the privilege of the Christians around them. They see Christianity as powerful—the source of marginalization and persecution, not a recipient. They don’t see that most Christians in the world aren’t male, white, rich, or powerful. Christians globally are more likely to be poor and marginalized. The other form of blindness is one of identification. If we are not careful, Christians living in privilege can blindly appropriate the mantle of martyrs, misusing their stories to defend ourselves from cultural critique at home. We should, in the power of the Holy Spirit, weep and mourn with those being killed every day for their faith in Asia, Africa, Europe, and South America. We must, in Jesus name help to bear one another’s sufferings, both in prayer and financial support. But we must be wary of feeling as if we are in similar danger and reacting in fear against outsiders. Our brothers and sisters are courageously loving and forgiving Muslims, Atheists, and others who persecute them. How can we do less from our safe position? We are not “persecuted” in the West, but we are hated. 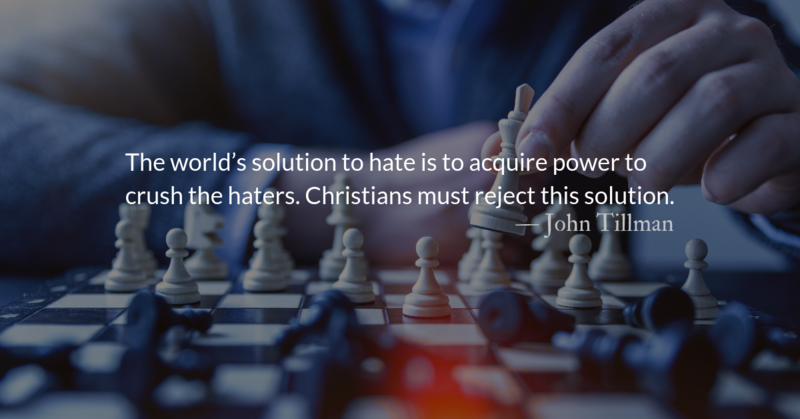 Christians must recognize that there are no political solutions to being hated. Our only solutions to being hated are relational. The world’s solution to hate is to acquire power to crush the haters. Christians must reject this solution. The gospel solution to hate is to surrender power and to love our enemies, overcoming evil with good. The reason we don’t want to surrender power and love our enemies may be that at heart, we really don’t want to end up like Jesus—powerless and crucified. May we remember that ending up like Jesus is the chief goal of Christianity. As a culture, we hate our neighbor, this I know, for the data tells me so. Our collective obsession with hate shows in our tweets, in our clicks, in our content views, and in how many times we watch gifs of our enemies getting punched or hit with objects. If we follow in the way he went, we also must be set at nought. You will find this truer every year as you go on. And anything is easier. Scourging is easier.